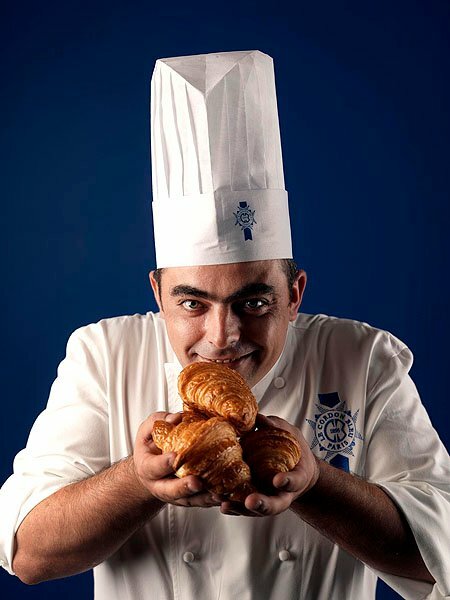 Having earned his CAP (Certificat d’aptitude professionnelle) and his BEP (Brevet d’aptitude professionnelle) in boulangerie and pastry, Chef Somoza began his career as an apprentice baker at Le Ritz Hotel, including the one Michelin star restaurant L’Espadon, where he stayed for 2 years. In 2001, he was recruited as an apprentice pastry chef in the bakery and pastry shop Le Petit Duc in Saint-Maur-des-Fossés. From 2002 to 2004, he worked as a baker at Saveurs d’Antan in Champigny-sur-Marne, a bakery and pastry shop which earned, in 2002, the Grand Prix from the Chambre de commerce et d’industrie of Paris. In 2004, Chef Somoza worked as a commis baker at the Bristol Hotel in Paris; with the two starred-Michelin Épicure restaurant. In 2005, he left France for Spain to work at the Fairplay Golf Hotel in Andalusia as a Bakery Chef. In 2007, he returned to the Bristol, first as Bakery sous-chef and was promoted to the position of Head Baker in 2011. Chef Somoza not only took charge of the boulangerie for the hotel’s restaurant but also for banquets, cocktails receptions, room service and all events. He remained there for 8 years and contributed to the Bristol obtaining a third Michelin star in 2009. Chef Somoza joined Le Cordon Bleu Paris team of Chef Instructors in 2016.